Little bigger than a grain of sand, this is officially the world’s smallest medical implant. Yet the tiny device is set to transform treatment for tens of thousands in the UK who are at risk of blindness due to glaucoma. The £900 i-Stent – a hollow metal tube about ten times smaller than a grain of rice – is so minuscule it can only be implanted in the eye using a high-powered microscope. Once in place, it drains off harmful fluid that accumulates in the eyeball and which puts pressure on the optic nerve, potentially causing irreversible vision loss. Hundreds of patients have already benefited from the implant, which takes less than 30 minutes to fit. Many people have since been able to discard the drops they took up to three times a day to keep their condition under control. 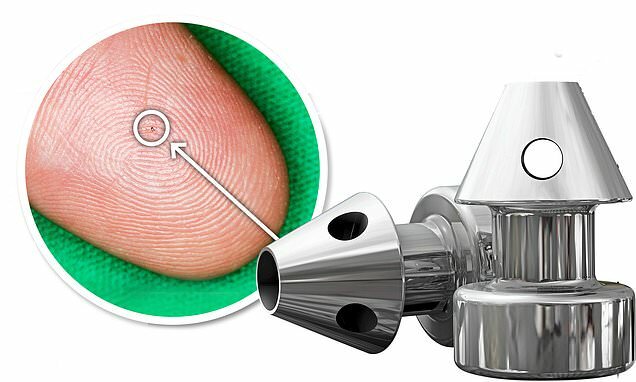 Thousands more could now be in line for the microscopic implants after the devices were approved by the NHS spending watchdog, the National Institute for Health and Care Excellence (NICE). Glaucoma affects at least 600,000 people in the UK and is responsible for more than ten per cent of blindness cases. One person in 50 over the age of 40 has early signs of the condition, although the vast majority go undetected at this stage. That figure rises to one in ten of those aged over 75. The number of people affected is expected to increase in the next few years due to an ageing population. In a healthy eye, fluids packed with important nutrients flow through the eye to ‘feed’ the various structures within, and then drain away naturally. In glaucoma sufferers, the drainage channels become blocked and the fluid gradually accumulates, pressing on the optic nerve. It leads first to tunnel vision, then total blindness.